On Saturday 29 September, the dramatised reading "Madame Châtelet and her Instagram followers", which features the life and discoveries of several women scientists throughout history, was represented in the Library "Biblioteca Sagrada Família", Barcelona, at 1 pm, in the framework of the activities of the European Researchers' Night (Nit Europea de la Recerca), organised in Catalonia. 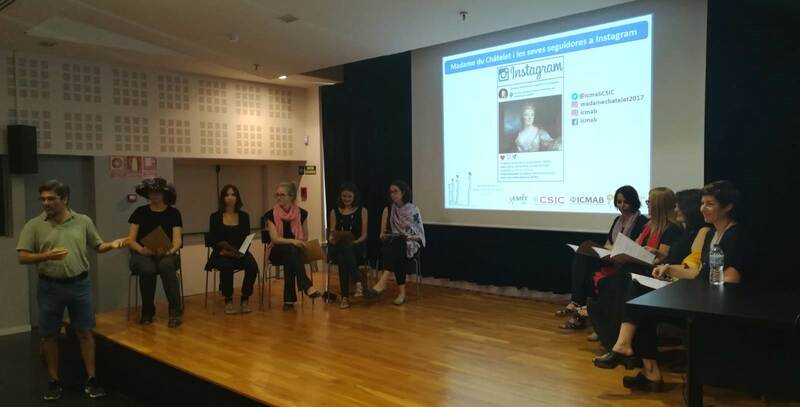 "Madame Châtelet and her Instagram followers" was created in February 2017 by some ICMAB women who wanted to celebrate the International Day of Women and Girls in science and prepared this play to be represented in secondary schools. One of the objectives of this lecture, is to visibilize some of the women scientists of different times in history. Some of them are more known than others, but all of them have in common their extraordinary talent and their great achievements. It is a project that is still alive, since the text can vary from time to time, some new characters can be included, and even the women who represent them keep changing, mostly due to their availability! Anyone at the ICMAB who wants to be part of it, please don't hesitate to ask them to joint this project! For example, in this representation, Pietat Sierra played Rosalind Franklin for the first time! The text is also available for primary or secondary schools who would like to do this play with their classes. It happened once already and it was a great success, at Escola Can Periquet (Palau-solità i Plegamans). The women that participated this time were, in order of appearance: M. Isabel Alonso, Mariona Coll, Mariana Kober, Anna May, M. Rosa Palacín, Arántzazu González, Núria Aliaga, Pietat Sierra and Rosario Núñez. Solene Marcelle Passemard helped out with the presentation. The other participants that couldn't come this time are: Carmen Ocal, Esther Barrena, Imma Ratera, Anna Roig, Anna Laromaine and Joana Martínez. Thanks to Raül Toran, organizer of the European Researcher's Night in Barcelona, and to the Biblioteca Sagrada Família, for counting on us for this event. And thank you to everyone who showed up to see the play!